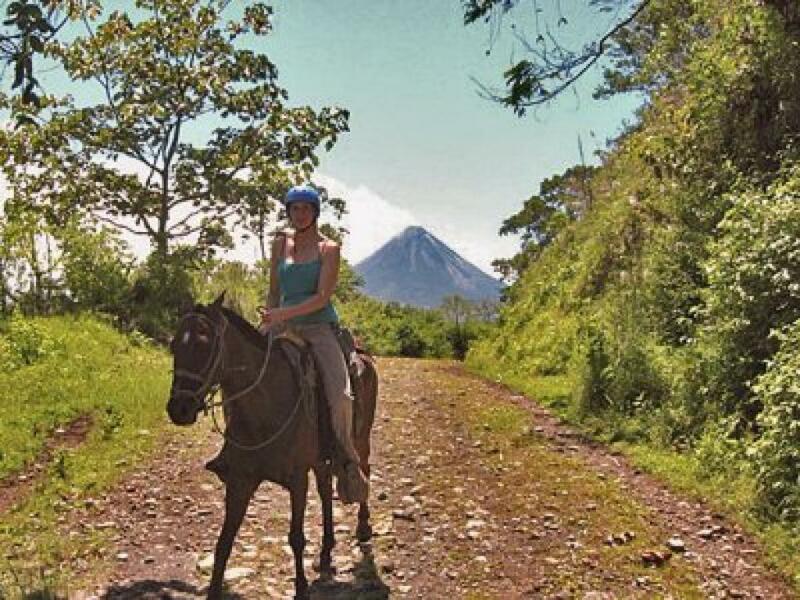 Horseback riding Arenal Volcano to Monteverde . 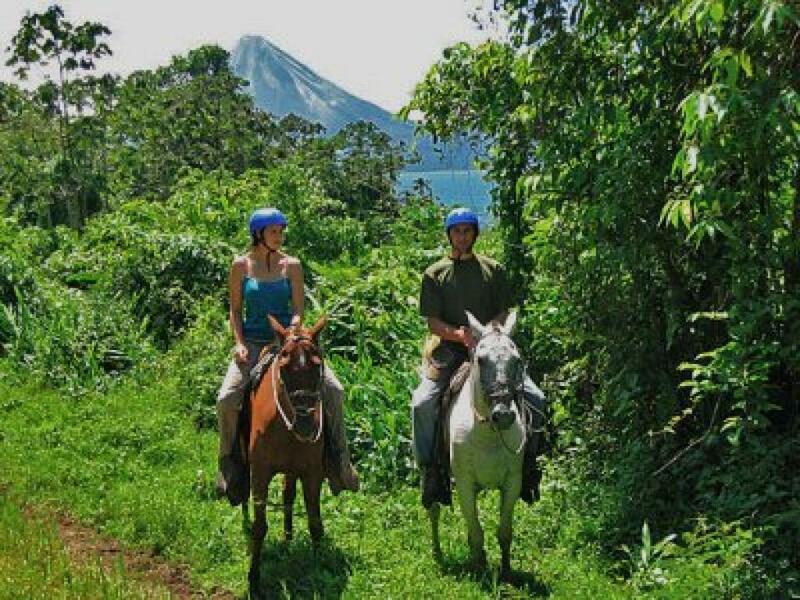 This is a great way to travel between the two places and offers some of the best views of Arenal Volcano and the Lake, as well as lush mountains and typical farms. 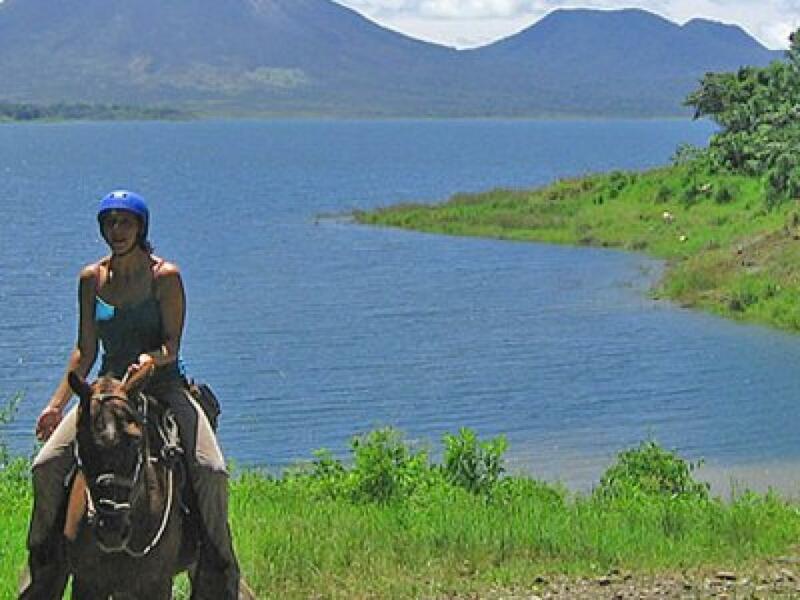 Going by horse gives you the opportunity of changing a travel day into an adventure - horseback riding Costa Rica at its best! This is an Adventure Connection, using horses, land and boat! Desafio Advenutre Company uses a great company that operates a route that we call the 'Lake Trail'. This is along the south shore of Arenal Lake and does not involve riding up or down the steep mountain to Monteverde. There are other trails such as the Castillo or Rio Chiquito Trail; you might read about them in your guidebooks, which are often unsafe and unfair on the horses when the weather is bad. With advance notice it is also possible for us to make arrangements to chauffeur** your car around the lake while you ride by horse. However, you must have permission from your rental car company and you need to check whether you will be charged to add an additional driver. 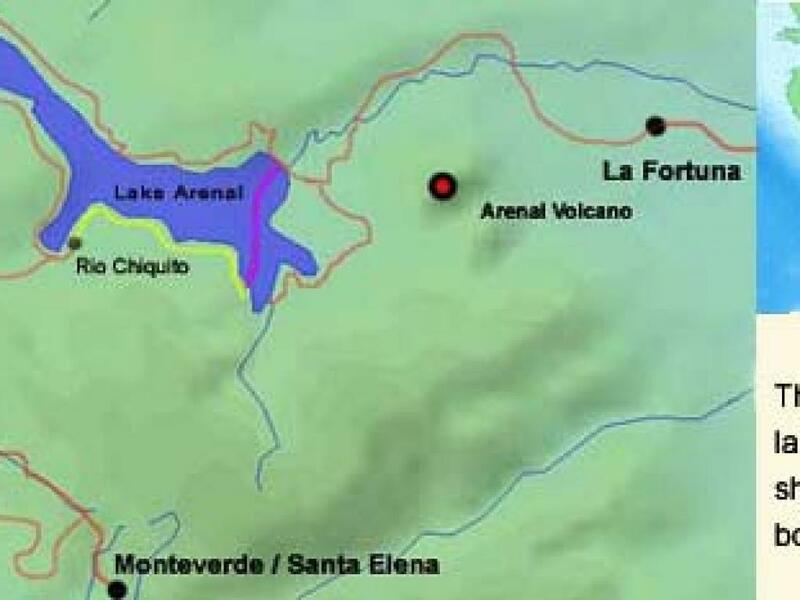 1.5 hours land transport from Rio Chiquito to your Monteverde Hotel. 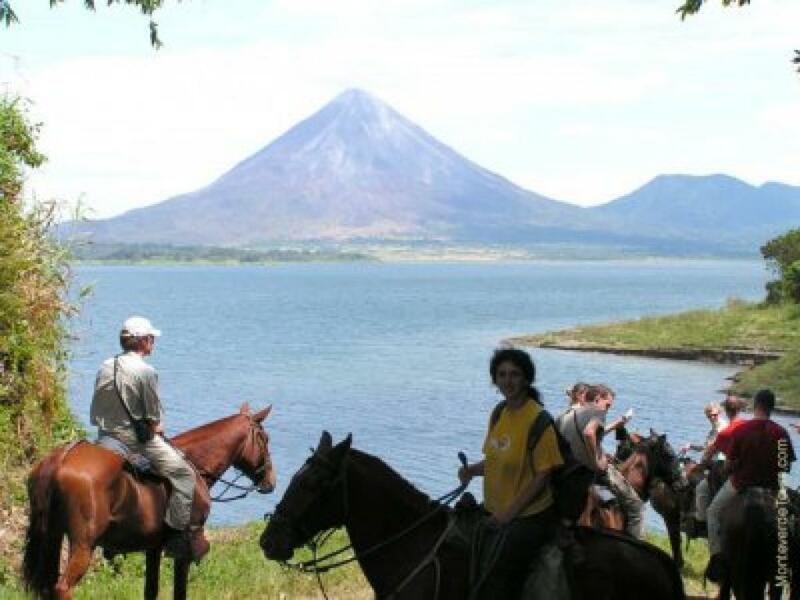 Along the Lake Trail there are many tropical birds, views of Arenal Volcano and scenic jungle. 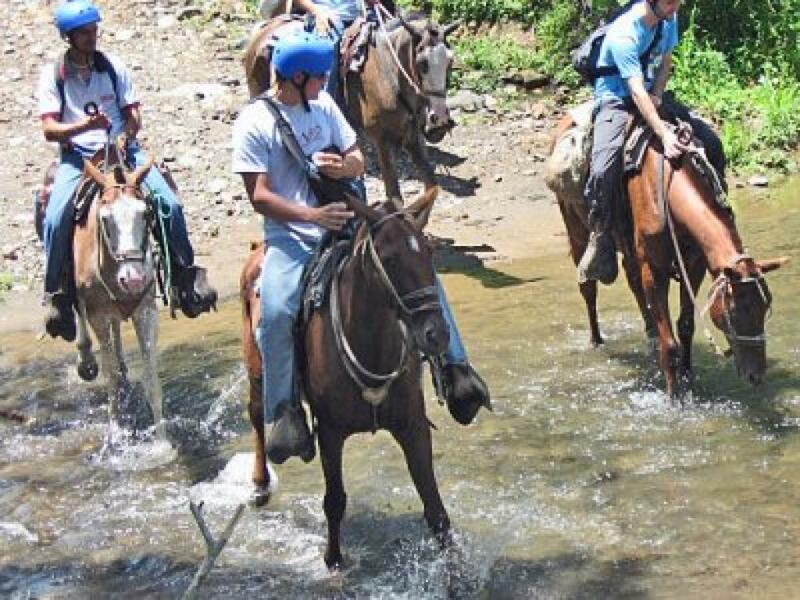 This horseback ride is suitable for riders of any experience level and the trail is along a little used back road. 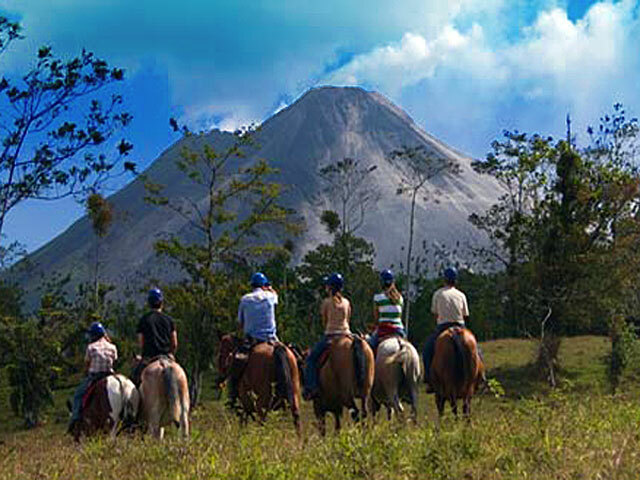 Horseback riding Costa Rica tends to be at a slower pace due to the nature of the terrain. **For the price of additional $65 we are able to provide a driver for your rental car so you can take advantage of this spectacular trip. IMPORTANT NOTE: There are a few hotels which are located outside the Monteverde and La Fortuna / Arenal areas that are outside our range of included pick up and drop off points. We are happy to provide transportation to these locations for an additional charge at a competitive price. 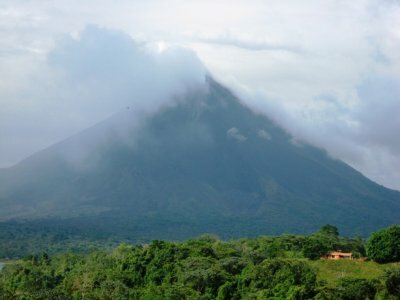 These hotels include but are not limited to the Arenal Observatory Lodge. Make this part of your package vacations in Costa Rica! land transportation from door to door. The Lake Trail tour takes approximately 5 ½ hours depending on the riders and the hotels where we will be picking up and dropping off.